Rights alongside the Unitarian Universalist Churches of Chicago on June 23. 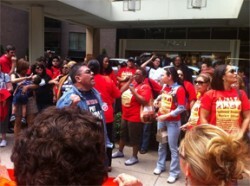 Their focus was to shine the light on the lack of domestic worker protection laws in Illinois. Amongst those present were several domestic workers like Digna Morales who are fighting to see change soon. “By coming together we are making a difference for domestic workers and the families and homes we care for. We deserve laws that protect us and will pass a Bill of Rights in Illinois,” she said. The Latino Union has been meeting with several domestic workers and listening to their stories and their reasoning behind the need for labor protection laws. Through these meetings they are attempting to gain the public support that they need in order for the Illinois Bill of Rights campaign to be successful.